This project was great fun! We needed to design the presence of Wavehunters in the St Moritz Hotel. The famous hotel use Wavehunters for their kids club, so we wanted to create a space that would make what was available clear to their holiday makers. We came up with the concept for a feature wall at the St Moritz Hotel, with changeable pictures in frames, shallow shelves and vinyl graphics. This way the wall will keep looking fresh and we can show off their great photography. 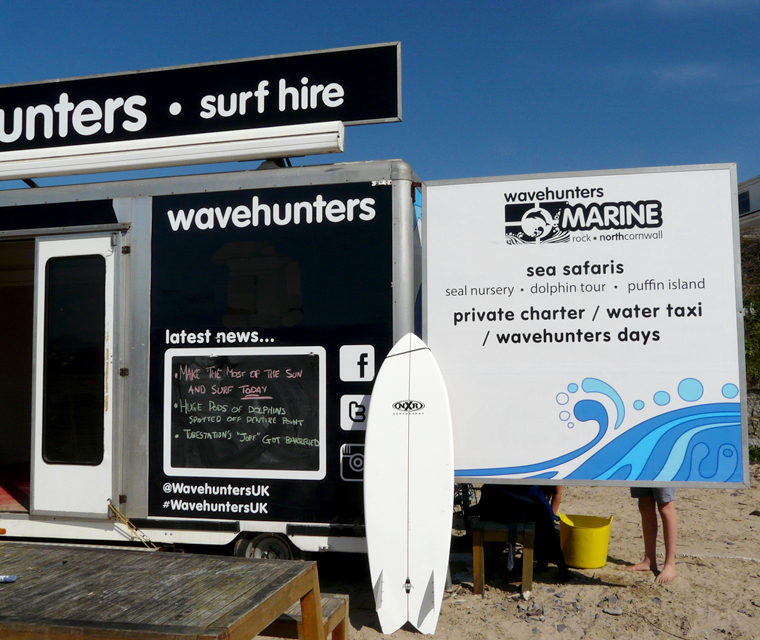 The wooden chests display the brochures we designed for Wavehunters, one shelf is focussed on the surf school and one on their boat trips. 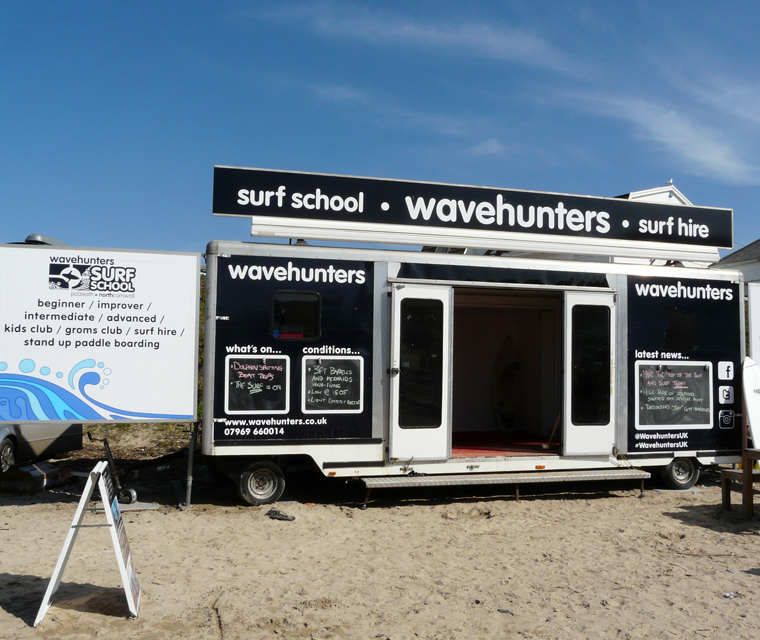 At Polzeath beach Wavehunters have a trailer that we designed the graphics for. The side panels open up to create a really great advertising space. 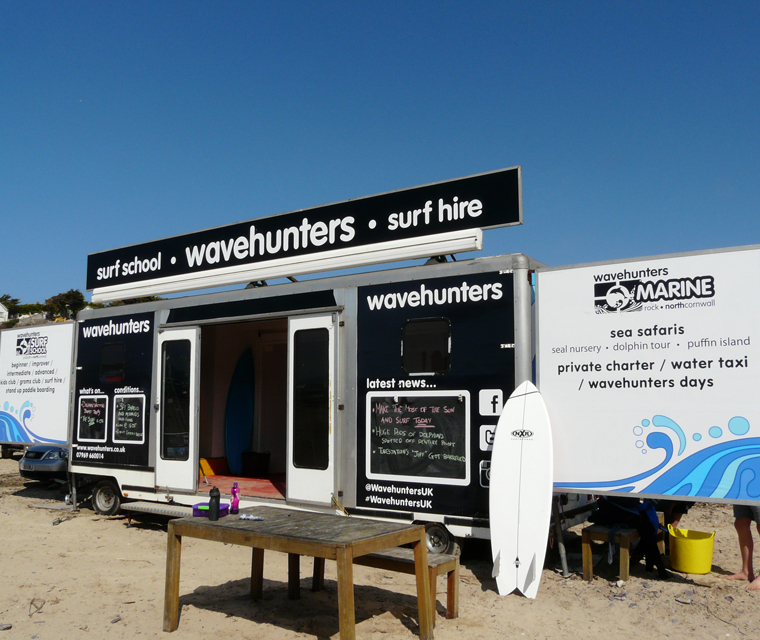 As part of the design we included black board areas where up to date info could be written about dolphins spotted & surf conditions. To compliment the black and white bold colour scheme we also illustrated some stylised waves and designed a photo wall. 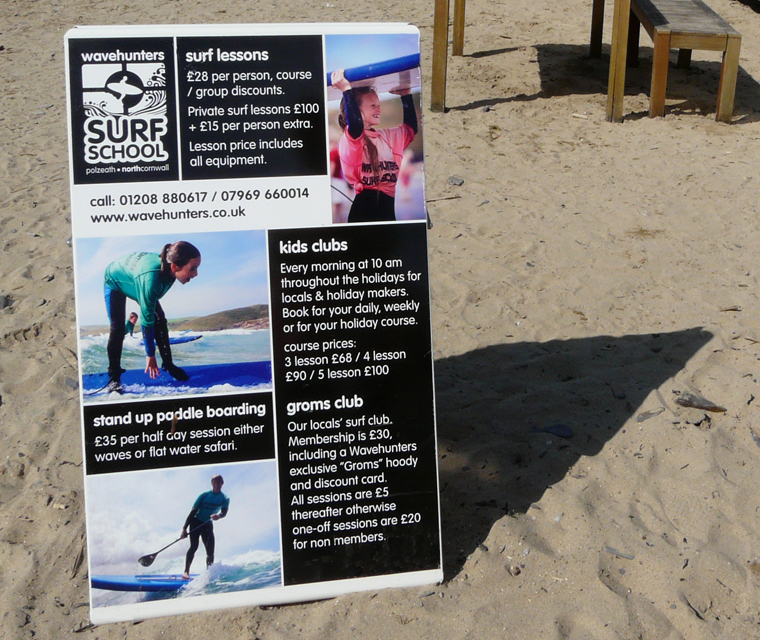 For the A board on Polzeath Beach, bright images were coupled with the strong Wavehunters brand of black and white and lowercase rounded typography. 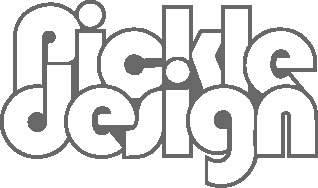 The reverse of the A board design sticks to the black and white brand colours. 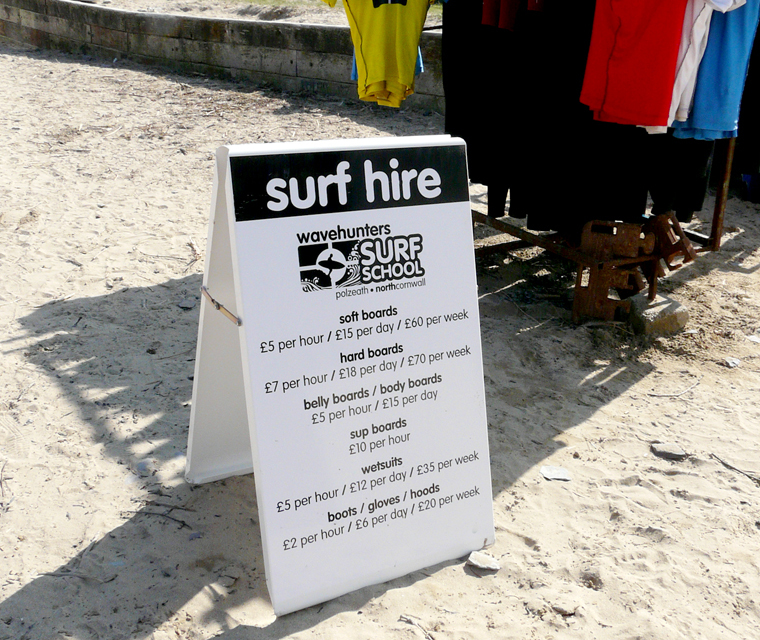 For the Padstow shop we designed black and white wrap around signs as well as branded chalk boards. 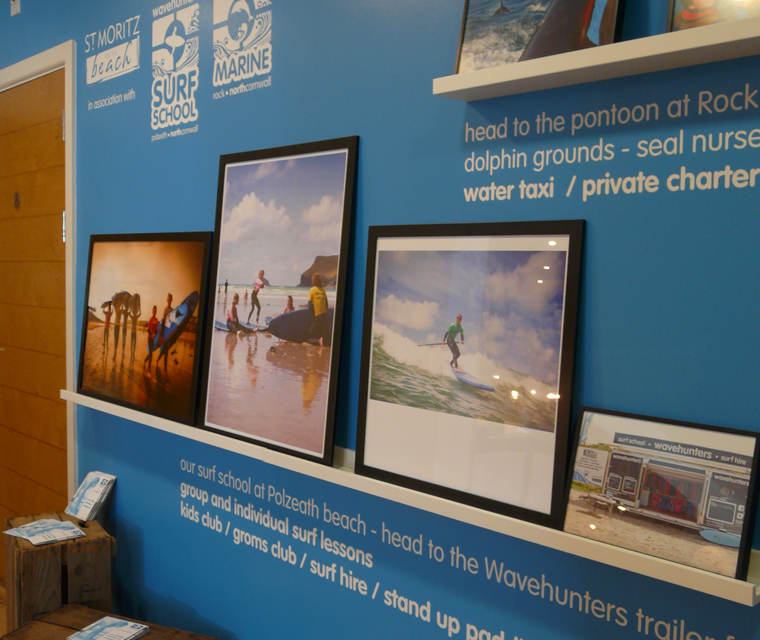 Inside we as designed a light box to highlight two key areas of the new shop – coffee and boat trips.